As I sit here trying to think of a topic to write about this week, all I can hear is hammering and banging just below me (while my computer screen shakes). What is that sound? It’s the sound of my husband hard at work on our basement. We recently moved into a house with an unfinished basement. We doubled our space from the old house for about the same price as what we sold our first home for. Not a bad deal! 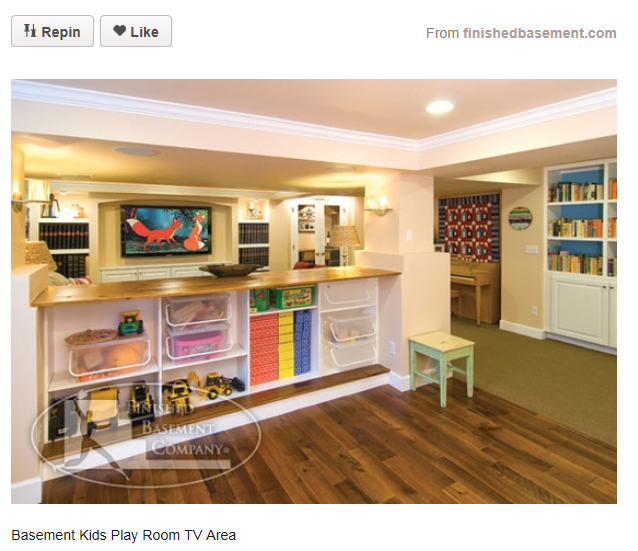 Except…finishing a basement is a lot of work and money and just where do you even begin? Well, we began at a little spot known as Pinterest…or what could be considered the new biggest addiction for moms. 🙂 I truly think I could spend hours per day on this site and not run out of things to interest me. So how did it help us with our basement? Well, first off, it helps you to discover how to quickly spend a fortune! But, more importantly, it helps someone who has never had experience with a project or craft figure out where to start, as well as give you a plethora of pictures and ideas for your project. 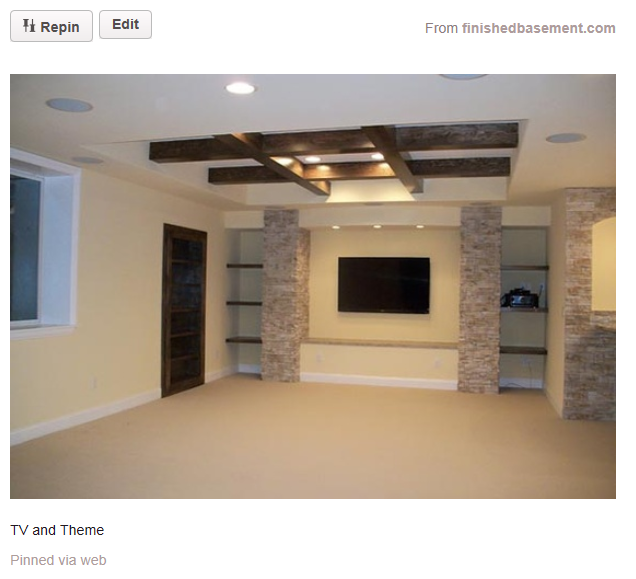 Many of the pictures that are found on Pinterest have a link to a blog or website that gives you instructions on how exactly to execute the project or idea. Another great source for finding out just how to do something with great visual demonstration is YouTube. 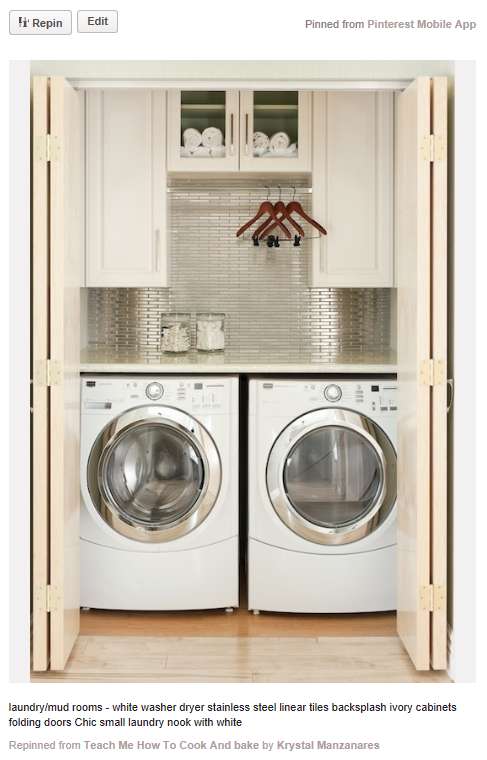 My husband and I spent hours looking for pictures of laundry rooms and basements. Below are just a couple of the examples we found on Pinterest. Social media sites like Pinterest are not only inviting to 30-somethings like myself, but they are also inviting to teens and young adults. A recent study by the Kaiser Family Foundation found that 96% of all children ages eight to 18 have been online at least once and spend over an hour and a half each day using a computer outside of schoolwork. The biggest reason for the increase in media usage among youth is the access to mobile devices. The Pew Internet Group (2011) reported that the top online activities for youth ages 12-17 include social networking, playing games and visiting video sites such as YouTube. It’s encouraging to know that even though I’m in my 30’s, I still do things that the “young-ens” are doing. Pinterest is quite addictive! I attended a social media conference last February and everyone was talking about Pinterest’s popularity was spreading like wildfire. I use Pinterest for a lot of recipes. Everyone is always looking for that healthy, easy to make recipe and Pinterest actually has a lot of those. I am currently looking into using Pinterest for my business… kind of. We are a B2B for pharmaceutical packaging, so I know no one is going to re-pin pictures of stoppers. I am actually looking to use it for philanthropic use. Each year, all of our locations across the globe pick a local charity to donate to and if possible, volunteer for. I would like to use Pinterest to help promote some of these local organizations and make people more aware of what they do. What are your thoughts on using Pinterest for something like this? I actually haven’t seen anyone using Pinterest in the manner that you are suggesting, but consering the success of Pinterest and how quickly “Pins” spread, I can’t imagin that it wouldn’t work. It seems like if you have a great group of friends, coworkers and support group, you should start there and have them help you. A small army of people working on a project together will far exceed just the efforts of one. It will definitely be interesting to hear if this works well. If we are still in touch after your charity events, please report back, I would love to hear from you! Best wishes with it, it sounds like a great cause! I created a Pinterest account and while the photos are interesting, I never incorporated it into one of the must check social media channels like I do Twitter or Facebook. I think it may be more helpful based on occasion (holiday, birthday party) or life event (house remodel). I wonder how many regular users the service has. I still receive emails that new people are following me on Pinterest, likely because it is connected to my Facebook account, but I have not posted anything there in months. Like Mike, I have a personal Pinterest account that is mostly dormant – except for a “House Addition” board I recently started. Although I haven’t been too concerned with the social aspect of Pinterest so far (no time), I’ve found it to be useful to me personally, as a repository or online wish list for all the things I’d like to see in the new addition. Pinterest could be useful in brand-building via a personal or a corporate account, however, and so our B2B company started building a few boards. There are lots of design and packaging boards on Pinterest, so it seems to be a good place to connect with potential clients. I like the idea of using Twitter, Facebook, Pinterest, LinkedIn, and the company blog to point at each other as well as at content that we generate or aggregate from elsewhere. I also really like Nicole’s idea of using Pinterest as part of a cause marketing campaign – great idea!